Nokia goes big on specs, but can Windows Phone 8 keep up? This phone is more power than precision, and it's a mammoth beast - but with a scaled up core and more icons, we do like the direction its poking Windows Phone into. With the launch of the Samsung Galaxy Note 4 and the LG G4, the smartphone war appears to have moved on from processor cores and camera megapixels and into the realm of screen inches and pixel density. It's not what your phone does, it's at how large a scale it does it, and how sharply. This trend towards the pocket-filling may run counter to the whole concept of a "mobile" phone, but that's to misunderstand what customers these days want from their phones (or at least think they want). People have the taste for HD films, uncompromised web browsing and expansive gaming on the go. They don't want mobile phones, they want mobile tablets. Android has several "phablet" champions, including the ones mentioned above. 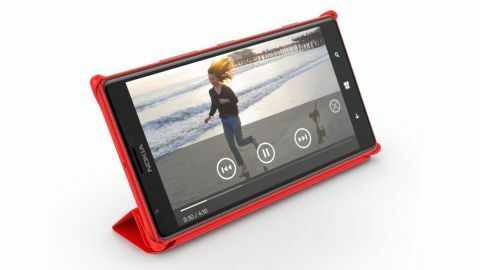 Now here's the Nokia Lumia 1520 to provide the first large-screen Windows Phone 8 flagship. In fact, scratch that: with the possible exception of the Nokia Lumia 930 the Nokia Lumia 1520 is the Windows Phone 8 flagship, full stop. It's evident in the spec sheet alone. This was the first Windows Phone 8 device with a Full HD 1080p display. It's also the first to run on a quad-core processor. We're not just talking about any HD display either. We're talking about a 6-inch 1920 x 1080 IPS LCD screen (producing 367ppi) with Nokia's ClearBlack and super-sensitive technologies. The former means that you can see it better when outside, and the latter means you can use it with your gloves on - two immensely practical features that tend to get brushed over too quickly. While we're at it, this isn't just any quad-core processor, either. This Qualcomm Snapdragon 800 chip, clocked at 2.2GHz and backed by a healthy 2GB of RAM, is a pretty powerful quad-core chip. It's the same processor as can be found in the Google Nexus 5 and in Windows Phone land only the Nokia Lumia 930 can rival it. With these two components alone, Nokia lifted the Windows Phone platform to specification parity with its Android rivals after three solid years of trailing firmly in its wake. It's since been topped by the likes of the Samsung Galaxy S6 and HTC One M9, but it's still quite a big achievement. There's that word again. Big. The Nokia Lumia 1520 is big in every way. Opening the box drew a genuine gasp from this typically stony-faced writer, who moments before had been typing out an email on his teeny-tiny iPhone 5S. Initially, the Nokia Lumia 1520 looks ridiculous next to Apple's stubbornly compact phone and even towers over the newer and larger iPhone 6. After a few hours' company with the 1520, you might well find that the iPhone 5S looks and feels like a toy. That's not to say that we prefer the Lumia 1520 as a day-to-day tool. Let's be straight - it's too big for most general users. At 6.41 x 3.36in, it will slip into the back pocket of your jeans, but only if it's that pair you bought in preparation for the forthcoming festive pig-out. And there won't be space in there for anything else. In fact, now might be the time to acquaint yourself with a good tailor, because you'll either need to reinforce those pockets or repair them. At 206g, this is one hefty piece of kit. To place the Lumia 1520's size and weight in context, it's a good 30g heavier than the Galaxy Note 4 with its similarly sized 5.7-inch display, and is a whole centimeter taller. It's also 7mm wider. Having said all that, the Nokia Lumia 1520 feels surprisingly sleek in the hand, and that's partly down to its 8.7mm thickness. Compared to other Lumia phones like the Nokia Lumia 1020 or the Nokia Lumia 930, it's proportionally flatter. Even the 20MP PureView camera barely breaks the rear contour with its subtle blister shape, unlike the angry carbuncle on Nokia's previous phone, the Lumia 1020. Then there's Nokia's customary high-class build quality. We've said it before, but Nokia is the only other smartphone manufacturer out there capable of rivaling Apple and HTC for strong, distinctive design. The Lumia 1520 continues Nokia's predilection for unibody polycarbonate designs. This means that it's essentially carved out of a single solid chunk of posh plastic. If you've never held a Nokia Lumia device before, then think of the HTC One X and you'll have an idea of how it feels. We didn't dare put it to the test, but the Lumia 1520 feels like it would survive its share of drops, and certainly a little rough and tumble - although its sharply pointed corners are asking to be dinged, and it doesn't use the very latest version of toughened Gorilla Glass. There's a slight ridge where the display meets the chassis. When Nokia introduced this design with the Nokia Lumia 800, its display melted into its body, which added an extra feel of class. It's a shame that's not been included here. Curiously, after the flamboyant flourishes witnessed elsewhere (especially in the shocking yellow of our test model), the Nokia Lumia 1520's physical buttons seem almost coy. They're practically flush with the chassis along the right hand side - even the two-stage physical camera shutter button barely raises its head. This helps with the ergonomics of this unwieldy device, but doesn't help when you're fumbling for the volume controls in the dark. On the opposite side of the device you have the microSD card slot and the SIM slot. The former is in addition to the 32GB of internal memory, raising the possibility of a whopping 96GB of storage. The latter accepts a nanoSIM, which is even smaller than the micro SIMs found in previous Nokia phones. It's the same standard used by Apple, and it serves to free up a few valuable millimeters of space for other internal components. Although we doubt that the Lumia 1520's innards are exactly struggling for air. In summary, the Nokia Lumia 1520 is certainly striking, but we wouldn't want to be struck with one. You're getting a lot of phone here for around $550 / £360 / AU$500. An awful lot. That is, if you can actually find it, which is becoming increasingly hard, especially in the UK.